This one's gonna be short and sweet! Although you guys haven't gotten to see my Needle in photos yet (April! I'm so excited!! ), I have replaced that cheap gold Musketeer monstrosity with a sword that, while still not perfectly accurate in the hilt/guard region, is lightyears closer to the Needle used in the show. The official licensed replica is book-Needle, and looks nothing like the Needle from the show. There are a few show replicas available on Etsy, but I wasn't satisfied with the quality of any of them. Ultimately, with the advice of my SCA fighter friend Jared, I cobbled together a similar blade from Triplette that would need only minimal modifications. ZWA Practice Epee Extra Strong 35"
This is how the blade was straight out of the box! As you can see, it was way too long. Arya's blade is small to suit her. I'd prepared for this, though: The aforementioned helpful friend Jared offered to help me cut down the blade to size using dangerous, scary power tools. He ended up finding a broken blade for us to work from, which was awesome because Jared got to keep my brand new blade, and we got to recycle! However, cutting down a new blade is a perfectly reasonable way to do this, if you don't have a broken blade. We trimmed down the blade, separated the whole contraption, removed the protective felt, and put the whole thing back together, and voila! Needle! Well... not quite. There are still a few things that aren't as accurate as I'd like. While the guard is way closer to Needle's actual guard, it's symmetrical, while Arya's is not. I'm cool with the guard for now, but ultimately I'd really like to 3D print a guard that's an exact replica! 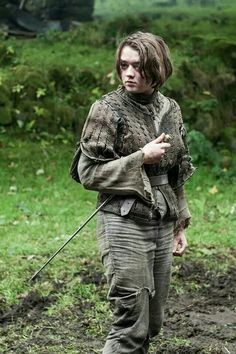 Do you do an Arya cosplay? What do you do for your Needle? Show me in the comments!